Then Let The Pace 6 Plus Show You What a Real Razor Can Do! With six narrow, ultra-sharp blades, a pivoting head, and a rejuvenating lubrication strip, this is the pinnacle of wet shaving perfection. Six Blades Redefine Smooth: Dermatological tests have repeatedly shown that more blades make a smoother shave with less irritation. Our latest and greatest six-blade design bears that out, and the blades are narrow enough so they won't clog as you go. 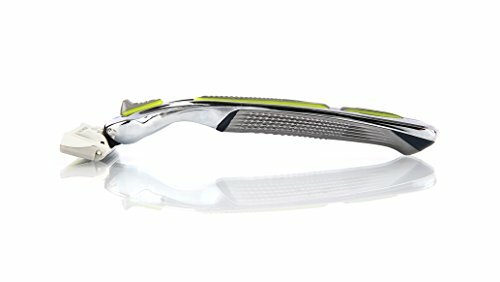 Pivoting Head Follows Your Face: With the pivoting head leading the way, and a wide guard bar digging deep to prep each hair before you cut, the Pace 6 Plus gives you the smooth shave you crave - even on the tricky parts. Lubrication Strip for Instant Relief: No need to wait till after your shave to rehydrate your skin; Aloe Vera, Vitamin E and Lavender combine to give you instant relief and make your face look that much younger. Comfy Grip for Maximum Control: The ergonomically-designed grip fits your hand like a glove and helps ensure there are no slips that can lead to nasty nicks. One Handle Fits All: Want to try another blade Your Pace 6 handle will mate with any other cartridge in the Pace series. 100% Satisfaction Guarantee: If you're not a happy guy after shaving with the Pace 6 Plus, just let us know and we'll make it right with a refund or replacement. Feel The Difference Six Blades Make; Order Your Pace 6 Plus Today! Save Money; Shave Smart!